We fund the tuition and other school costs (uniforms, school supplies, etc.) for 20 Guepard Boxing Club (GBCCS) children. The annual cost per student for the 2017/2018 school year is $250 USD, a bargain by U.S. standards, a near impossible dream by Haitian standards where the average annual per capita income is less than $500. If we are able to raise funds, we send them directly to Haiti, unconditionally earmarked to put kids in school. The GBCCS managers select the children based on need, not on performance. Every child in the program has the need, but as you can imagine, some are worse off than others. Here are facts about the 20 kids we send to school. 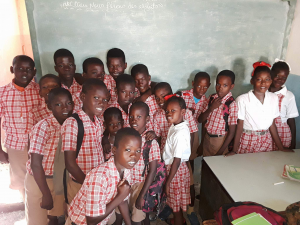 The 20 children we fund for the 2017/18 school year attend Foi de Job, an elementary school in the heart of Cité Soleil. The youngest children – Watson Brunache, Jean Benel, and Andre Judson – are 9-years old and attend first grade. Bonhomme Deluckson is the oldest child. Bonhomme is 17-years old and attends sixth grade. Each student receives a quarterly performance grade in Creole (the native language), French (the national language), Social Studies, Math, and Science. We receive and review report cards for each child. It helps to understand the grading system to maintain perspective. 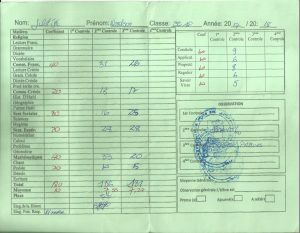 As I received and analyzed report cards from Haiti, I asked the principal what a passing grade was. When he told me 50%, I initially thought he had made that number up, but as I researched education in Haiti, I learned that Touta – whose school is certified by the Haitian Department of Education – is correct: 50% is the official passing grade in Haiti. I should not have doubted him. This revelation led me to explore grading systems around the world. I learned they are quite different from one country to another. In Nigeria for example, a student will pass if she achieves 40%; in Tanzania, 35%. In Poland, 50% is “satisfactory.” In Switzerland, a student will pass with 60%, but in Sweden, like in Haiti, a student with 50% will pass. We are pleased to report that 16 of our 20 students are passing after three quarters of the 2017/2018 academic year. Regardless of performance, THESE CHILDREN ARE IN SCHOOL and are trying. That is MOST important: THEY ARE IN SCHOOL, which is a major accomplishment when we consider that Cité Soleil, Haiti is one of the poorest communities in the Western Hemisphere. We support these children because we believe that EDUCATION plays a primary role in creating an environment for children and adults to make the world better for themselves and for the community they live in. Here are facts concerning our performance through the third semester, which concluded at the end of March. for our 20 Guepard students is 56%. Only one student, 11-year old Jean Woodson Jilot who is in the third grade can claim an ‘average’ cumulative grade greater than 70%; Jean Woodson has achieved 76%. Seven of our students perform with a cumulative grade greater than 60% but less than 70%. Eight more students ‘pass’ with a cumulative average greater than 50% and the remaining four students have a cumulative grade less than 50%. Not surprisingly, our students perform best in Creole, their native language. Three children score greater than 80%; eight, greater than 70%; two, greater than 60%; and seven less than 60%. We are strong in science. Jean Woodson is at the top of the class with 93% followed by 11-year old fourth grader Maxime Widelande with 80%. Six students have year-to-date scores greater than 70%; eight students score in the 60 – 70% range; two students score in the 50 – 60% range; and only two students are not passing. Five students carry a cumulative grade through the first three semesters greater than 70% in Math, and five score greater than 60%. Five more students are passing, and only five are not passing with less than 50%. Only two students perform greater than 70% in French, the official language of Haiti. Thirteen more are passing, but five have yet to pass. Our weakest area is Social Studies where only 11-year old fourth grader Maxime Widelande performs greater than 70%. All but four of the remaining 19 are passing. Our children, their parents, teachers, and mentors continue to climb the steep hill before them. No one has given up. Our next ‘Team Guepard’ post will present a unique way that Guepard Boxing Club helps the children they work with to do better in school. The club is about far more than boxing… It is about life. Guepard Boxing Club is doing good things for the children in Cité Soleil. If you would like to help, please consider a donation. The “Donate” button allows you to make a tax-exempt donation through Gail Rongen’s Nicole Megaloudis Foundation. Please add a note directing the donation to the kids at Guepard.